We are celebrating World Autism Acceptance Month with the launch of yet another groundbreaking initiative! The Autism Society Philippines is pleased to open the applications for Batch 1 of ASP's HOMEpowerment, a program that offers 10 months of therapy to children with autism from indigent families, for a minimal fee of P50 per session. The program will be composed of occupational, speech and non-traditional therapy sessions. Parents will also receive training on how to continue their child's program after the 10 months, empowering them with the knowledge and skills to confidently care for their child with autism. This offering was made possible by the generous donation of Kiehl's Philippines, as part of a global effort to support autism causes. 1.4 allow home visits by a social worker. 2.3 be clear of physical disabilities or co-morbid medical conditions. 3) The applicant family must fill out this form below. ASP will schedule interviews with the applicant families in April 2018. THERE IS NO NEED TO FOLLOW UP. WE WILL REACH OUT TO ALL APPLICANTS FOR INTERVIEW SCHEDULES. PLEASE BE PATIENT. 4) ASP will select thirty (30) children with autism to benefit from the program. The venue of the pilot batch of the ASP HOMEpowerment Program will be at the Quality Life Discoveries, at No. 70 20th Avenue Barangay San Roque, Quezon City. 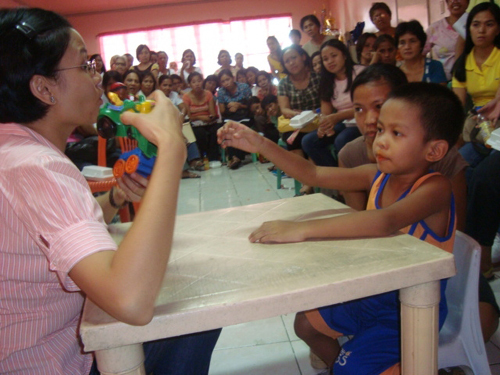 The Autism Society Philippines aspires to extend this program to more families and to bring it to the provinces. Our experience from the pilot batch will help us develop the program to better answer the needs of a growing autism community.